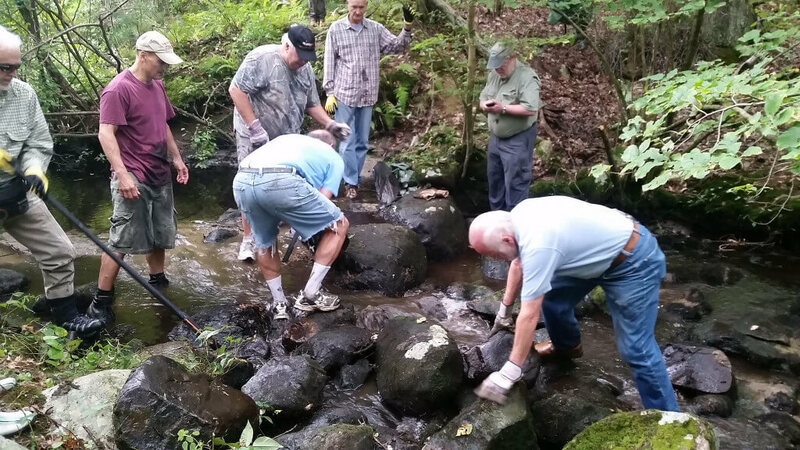 It took 19 very enthusiastic volunteers only two hours to clear a pair of boulder dams from Traphole Brook in Walpole last month. But the native brook trout for which Traphole is famous, were even faster, moving up through their newly restored habitat just 30 minutes after the dam had been cleared. Armed with heavy pry bars, tarps, hand trucks and shovels, volunteers set to work on two small boulder dams at 9 am. We had expected the process of removing and re-positioning the boulders to be much more challenging than it actually was. In fact, we had come with a number of elaborate strategies and tools for moving heavy rocks with only people power and we were counting on two days worth of work, but in the end just 120 minutes of simple grunt work was all we needed. The volunteers included some of our most tried and true river cleanup volunteers, several nearby residents, a few NepRWA Board Members and two members of the Greater Boston Chapter of Trout Unlimited. All the volunteers seemed to be energized by the opportunity to make one of the Neponset’s healthiest streams even better. Perhaps most excited of all were our volunteers from Trout Unlimited who were very impressed with the quality of the existing stream habitat in an area so close to Boston, and thrilled by the chance see the sections of stream above and below the barriers reunited into a single continuous habitat that will be more than the sum of its previously fragmented parts. You can view all the photos of the day over on our flickr site.